Exclusive interview with Andrea Varrone, Show Director of the Digital Signage Expo. AV Technology: Where will BYOE take us in 2016 in terms of digital signage? 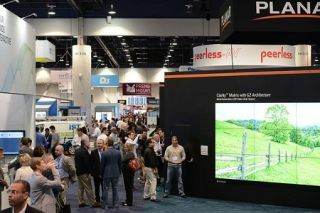 The annual Digital Signage Expo showcases emerging display and connectivity technologies and their relevance for digital signage users, managers, and AV integrators. Photo courtesy of Exponation Andrea Varrone: In today’s environment, everyone is carrying around their own personal digital sign in the form of smart phones, tablets, wearables, etc. Marketers now have the ability to reach shoppers, students, passengers, et cetera—literally 24/7. That’s why professional systems integrators should consider incorporating mobile accessibility into any and all projects on behalf of their clients. What are new and exciting applications in IoT (Internet of Things) + digital signage? Because we are now living in a connected world, all devices are talking to each other, and experience in all verticals will be synced and integrated. This is going to create a variety of brand new digital signage products that can incorporate this multiplicity of devices. That means that professional systems integrators would be well advised to keep up with the all the newest technologies and applications on behalf of their clients. Big data and digital signage—what’s new? Big data has the ability to improve and substantiate the outcome of an investment in digital signage. Whereas in early years budget approval for digital signage implementation was extremely challenging, big data is changing that through analytics and analysis going forward. Integrators have the opportunity to work with their clients to ensure that they have established metrics for their products to enable them to recognize when installations are successful. What are the new and exciting business digital signage models in 2016? Smart Building Technology, Call Centers, Manufacturing Plants, Corporate Communications. What should tech managers and facilities managers keep in mind re: this year’s digital signage trends? As always, education will be key as technology continues to evolve quickly. DSE is a great place to get up to speed on the latest and greatest technology advances.